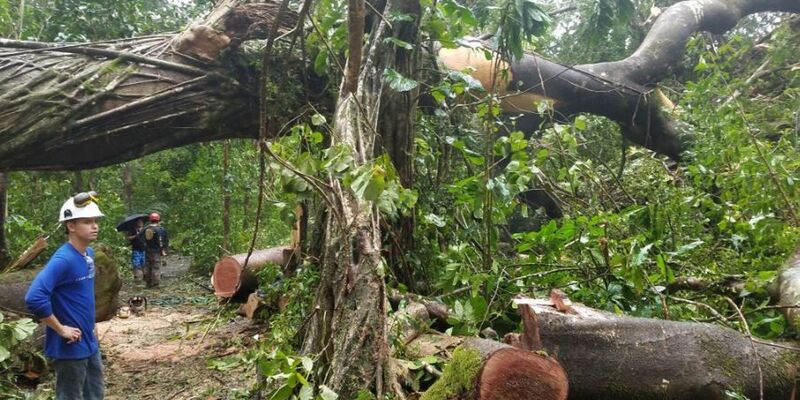 MANOA, OAHU (HawaiiNewsNow) - The popular Manoa Falls trail will be closed on Monday as state Department of Land and Natural Resources crews remove a fallen Albizia tree. The DLNR said the 100-foot tree fell due to high winds and is now lying over the trail, posing a safety hazard. In addition to clearing the tree, crews will also be removing an aging toilet structure at the trailhead. The toilet structure, which was donated by the Hawaii Tourism Authority, will not be replaced, so hikers are asked to use the restroom facilities at one of the public parks in Manoa. "Closed trail" signs will be posted at the trailhead and parking lot. Crews will also be turning hikers away throughout the day. The trail is expected to reopen on Tuesday morning.